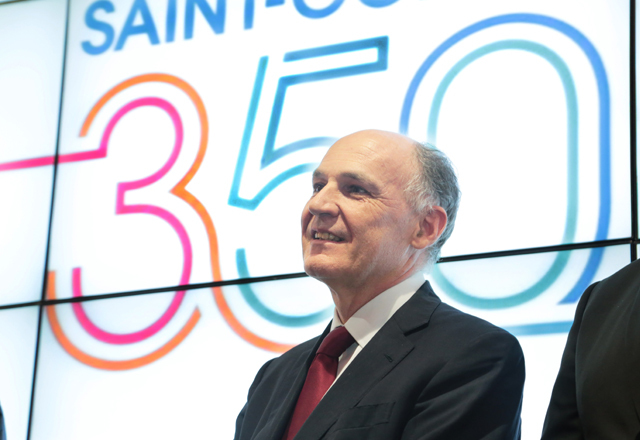 In 2015, Saint-Gobain turned 350. An exceptional anniversary that the Group celebrated by looking back at its history and focusing on the future while emphasizing its culture of innovation that has been a constant since its beginnings. It has been an exceptional year, from the launch of the celebrations in Shanghai (China) in January all the way to their culmination in Paris (France) in October. The “Future Sensations” pavilions, the www.saint-gobain350ans.com online exhibition, the anniversary book, the mobile game and the stamp issued by the French postal service, La Poste, made it possible to share with a great many people the reasons to believe in the Group’s future. Worldwide, Saint-Gobain teams brought these reasons to life through their many local initiatives. It is with pride that we celebrated our 350th anniversary: a unique opportunity to promote our Group and its ability to project itself into the future. More than 500,000 people visited Saint-Gobain’s “Future Sensations” pavilions during their four world tour stopovers (Shanghai, Sao Paulo, Philadelphia and Paris). Under the impetus of his Minister Colbert, Louis XIV created the Manufacture royale des Glaces in October 1665 to counter Venice’s supremacy in the manufacture of mirrors. The development of the table pouring method made it possible to manufacture large sized mirrors and was the first illustration of the Group’s tradition of innovation. Backed by its exceptional expertise and its capacity for innovation, Saint-Gobain celebrated its anniversary with its sights firmly set on the future. 350 years and just as many reasons to believe in the future. These reasons are based around six central pillars of the Group’s strategy and values: the world has no boundaries, sustainable habitat is within our reach, innovation is transforming the world, talent is infinite, habitat for everyone is achievable, and Saint-Gobain builds on the past and plans for the future. Watch the 350th anniversary video to find out more about these reasons. Saint-Gobain, the world leader for habitat, designs, manufactures and distributes building and high-performance materials. To demonstrate its ability to reinvent and project itself into the future, Saint-Gobain invited the public to engage in an unparalleled sensorial and artistic experience by visiting the four “Future Sensations” pavilions. Demonstrating Saint-Gobain’s capacity for innovation, especially in the area of building materials, the four pavilions were an opportunity to experience the importance of comfort in our living spaces through four main themes: LISTEN, CREATE, COLOR and LOOK. These pavilions toured the world: Shanghai (China) in January, Sao Paulo (Brazil) in April, Philadelphia (United States) in June, and Paris (France) in October. Explore the pavilion visitor’s guide. Watch the playlist of videos recounting the world tour of the pavilions. the traditional copperplate engraving technique focusing on the glassworks’ historic building in the village of Saint-Gobain that gave the Group its name. Watch the video about the stamp’s production (in French only). Saint-Gobain wanted to provide as many people as possible with an opportunity to discover or rediscover its history with an online exhibition and an anniversary book translated into five languages (French, English, German, Spanish and Brazilian Portuguese). The www.saint-gobain350years.com exhibition, with its 700 archival documents, takes visitors through a gallery of habitat innovations, allows them to explore in detail six thematic environments (transformation of the material, from advertising to marketing, Saint-Gobain throughout the world, the major achievements, the world of work, and governance and corporate cultures), and to experience through a spectacular 3D reconstruction how the Manufacture des Glaces operated on the eve of the French Revolution. Visitors can also contribute to the exhibition by uploading their own documents and testimonials to the site. Almost 1,500 documents have been collected since the site was launched. The book called “Saint-Gobain 1665-2015 – The history of the future” uses QR codes to link to the online exhibition. Published by Editions Albin Michel, it is an opportunity to discover Saint-Gobain’s past and present from a different, cross-business approach. Visit the online exhibition website. Download the online exhibition press file. 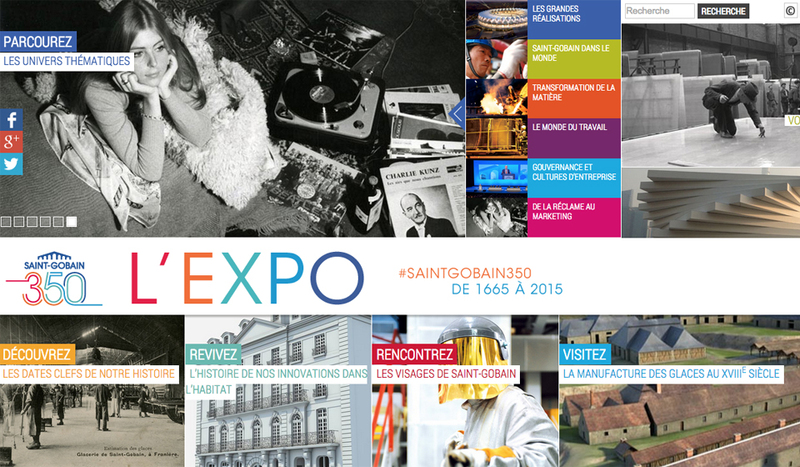 Pour ses 350 ans, Saint-Gobain a décidé de partager largement son histoire en mettant en ligne une grande expo- sition, Saint-Gobain350ans.com. Réalisée par l’équipe du centre Saint-Gobain Archives de Blois, celle-ci présente dix univers thématiques, de nombreux documents d’archives et séquences audiovisuelles inédites ainsi qu’une reconstitution de la manufacture des glaces de 1785. Les deux usines de Sully-sur-Loire fabriquent des verres de haute technologie, en grande majorité pour les pare-brise d’Airbus, du Rafale et d’autres avions.